DIN Standards are issued for a variety of components including industrial fasteners as DIN 7972 Slotted Countersunk Head Tapping Screws. DIN 7972 Screws are manufactured from Austenitic stainless steel A2 and A4, Brass, Carbon Steel or many other materials. DIN 7972 Screws are available in a wide range of sizes, shapes and materials. 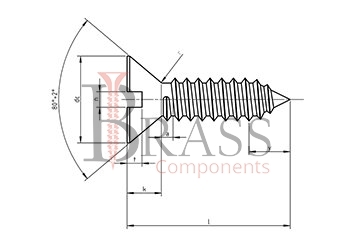 DIN 7972 Screws are available with a countersunk head and straight slot. The latter is most often used zinc coating, which protects metal from corrosion of metal, thereby increasing the time of operation of the screw. Slotted Drive Flat Countersunk Head Self-Tapping Sheet Metal Screws. The Flat Countersunk Head has a flat surface on top and a cone shaped bearing surface with a head angle of approximately 80°. Designed to cut the threads into pre-drilled holes of the substrate into which they are screwed. The recommended pilot hole sizes vary, depending on the diameter of the screw to be used and thickness of the substrate material. Fully Threaded with a coarse thread and a gimlet point. Used in furniture production, machine building, instrument making and other industries. Recommended to be used in thin gauge sheet metal, resinous plywood and composite materials. 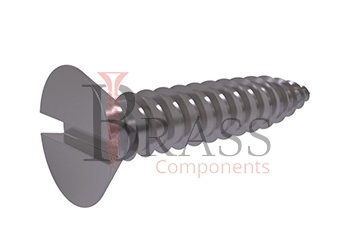 Typically used in application where the head of the Metric DIN 7972 Self-Tapping Sheet Metal Screw is to be flush with the surface of the substrate. We manufacture DIN 7972 Screws as per Custom Specification and export in France, Italy, Switzerland, Poland, Greece, UK and other European Countries. For more Information, Please Contact Us or Inquiry Now.